Grandparenting and psychological well-being: how important is grandparent role centrality? 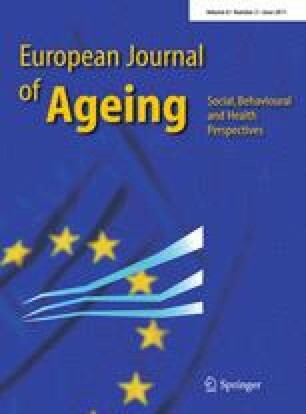 The purpose of the study was to examine the association between the centrality of the grandparent’s role and psychological well-being in the population of European grandparents, aged 50 and older. The study was a secondary analysis of data gathered in the first wave of the Survey of Health, Ageing and Retirement in Europe. The sample included grandparents who looked after their grandchildren without the presence of the parents (n = 3,888). Respondents’ scores on the Center for Epidemiological Studies Depression Scale were regressed on the frequency of contact with grandchildren, beliefs and attitudes about grandparenting and grandparent-focused role occupancy, and on a composite measure of grandparent role centrality, controlling for age, gender, education, household income, physical status, and country. The findings negated the hypothesized positive association between grandparent role centrality and psychological well-being. Only one of the three indices of interest—grandparent-focused role occupancy—was related to the psychological well-being outcome when background and health variables were taken into account. The study refutes the central claim of role theory according to which salient roles are more beneficial to the psychological well-being of the individual than are other roles, especially in old age. It also questions the theoretical framework of grandparent role meaning that is commonly cited in the literature. SHARE data collection in wave was primarily funded by the European Commission through the fifth framework program (project QLK6-CT-2001-00360 in the thematic program Quality of Life), the National Institute on Aging (U01 AG09740-13S2, P01 AG005842, P01 AG08291, P30 AG12815, Y1-AG-4553-01, and OGHA 04-064), and other sources.